WaPo asked, “Why is this happening?” Then they gave their answer. Simple. Many people, including the president of the United States, refuse to let the 2016 election end. Few defeated candidates loom as large in our national conversation as Hillary Clinton, who has been some combination of famous and infamous since 1991. With that size comes an unusually lengthy half-life, as political actors who could move on have no idea how to frame their arguments without her. WaPo was half right, in that the reason Hillary Clinton is unpopular to an unprecedented degree is due to Hillary Clinton. However, the fake news WaPo is wrong to blame President Trump in any way. The president can’t quit Hillary. This is fairly obvious — unusually for a victorious president, Trump cannot stop talking about the candidate he defeated. He rates the controversies facing his administration on whether the media did enough to cover controversies facing Clinton. I recall President-elect Trump issuing an olive branch to Hillary Clinton, when he said he wouldn’t go after her for her crimes. I and most of conservative America felt anger over this, as Hillary Clinton deserved prosecution for her crimes and the cover-ups. Regardless, Trump showed mercy, and likely felt the Clintons would heal from their wounds and eventually join him. They didn’t. At first Hillary Clinton emerged from her rat hole and played nice. She encouraged people to support our 45th president. Then Clinton went on the attack. And she has been attacking President Trump ever since. We documented our thoughts around a video Hillary Clinton made for the DNC in Feb of this year. Hillary lauded protesters, arguing that these entitlement-minded, criminal thugs are America’s future. They have no power in Washington, so Hillary told liberals to continue protesting the election winners. Instead of “working across the aisle” as she promised, Hillary fosters further division in America. Truth be told, Hillary Clinton hasn’t dropped in the polls. 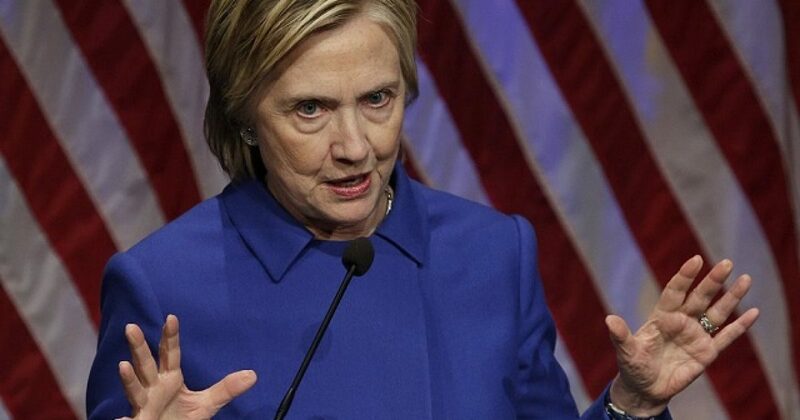 Her poll numbers have been tainted since the Left’s coronation of her as America’s new king. The original polls of Clinton’s likability were bogus and so are recent polls. In both cases Hillary fared worse than the numbers indicate. Most Americans detest the Clintons. This was proven time and again in “reality polls” where nobody showed up for either of them. And if they aren’t scratching the backs of big wigs, the Clintons couldn’t get enough people to want to see them to fill a telephone booth. This poll is the closest the media will come to admitting the irrelevance of the Clintons. So, I give them credit for that. What I’d really like to see are real polls of Obama and other leftists. The world needs to know about the conservative mandate, a mandate for sanity to return to life.